Liners are a great way to dress up a tent with a touch of elegance. All of our liners are a gathered fabric material. We carry liners for all of our tents. 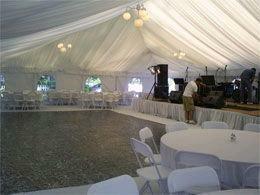 If you do not see this size tent you have listed, please call for pricing. Some tents require special liners and are not shown here. * Please call us for any questions on our tent liners rentals in Tacoma, Lacey WA, Olympia and the South Sound Metro area.